It's gutsy for DeWalt to present a cordless table saw to the world, but it is really a solid step forward with the only major trade-off being a smaller blade. You have to admit that DeWalt’s introduction of the DeWalt FlexVolt Table Saw is a bold move. Lithium Ion technology has advanced far enough to satisfy once skeptical tradesmen who thought battery power couldn’t supplant AC power in drills and saws. But now in table saws, too? A failure at this point would still be considered a worthy attempt, but also proof that batteries just can’t cut it for everything. I’m a bit dubious but I’m certainly willing to give this thing a shot. If it’s a success, it will be a workflow improvement of leaps and bounds. I’m one of the Pros that’s taken the early leap of faith by jumping all-in to the FlexVolt system to see if it really can create a cordless jobsite. So far, I’ve been impressed and the FlexVolt miter saw solved the problem of power on a 12-inch saw with the use of two FlexVolt batteries to replace the 15-amp motor with 120V DC. But the DeWalt FlexVolt Table Saw runs on just one at 60V. Is it really up to the task? At about 13 inches tall, roughly 23 inches square, and 48 pounds, the DeWalt FlexVolt Table Saw must have the best power-to-weight and size ratio of anything available. It even has a handle for easy carrying. And yes, you can carry it with one hand. What’s even better is that it includes the same features as DeWalt’s full-sized saw – the telescoping, rack-and-pinion fence with swing arm for large material support, dust collector adapters on the saw and blade guard, tool free adjustment for the guard and riving knife, table coating, and onboard storage for the blade guard, fence, wrenches, and miter gauge. It also includes things that even the corded saw doesn’t – a dust collection shroud below the blade that channels more waste toward the dust collector, a brushless motor, large rubber feet, Power Loss Reset that defaults to “off”, and of course, cordless technology. The saw’s 8-1/4-inch blade has a thin kerf and 5/8-inch arbor with a design specific to the FlexVolt line and cordless efficiency. A standard 15-amp table saw is going to have a 10-inch blade, so this is clearly one area that DeWalt made a trade-off to run on one battery. The blade spins at a no-load speed of 5,800 RPM and can cut 1-3/4 inches at 45° and 2-1/2 inches 90°. 24 inches of ripping capacity to the right of the blade and 12 inches to the left isn’t too shabby for the compact profile of this saw. Hungry for More FlexVolt? Here’s Our Circular Saw Review! We do a lot of finish work but for this review, I took the DeWalt FlexVolt Table saw to a home we’re building on a beautiful lakeside lot. Although there’s mostly just trim work left, I’ve used the saw from the beginning of the job. Any doubts I had that it could handle the job were quickly dispatched. To have such a powerful saw in a small, portable package is so helpful to the job (or multiple jobs at once, as the case may be) that it’s hard to understate it. I’ve cut 3/8-inch strips off 2×4 PT at full depth, ripped plywood sheets, and trimmed out this house using this model, and it didn’t fail me once nor leave me regretting the use of a cordless saw. Speaking of No Regrets, Check Out Our Jobsite Table Saw Shootout! The smooth movement of the rack-and-pinion fence is excellent like its predecessors. That’s a feature that most Pros around PTR circles usually praise. The fence is easy to take off – there are pins for easy placement. Since the entire table moves on the rack and pinion system rather than sliding the fence, it stays true and locks down well. The work support swingarm is a feature I’ve never actually used before, although once I used it for wide cuts I didn’t want to be without it. 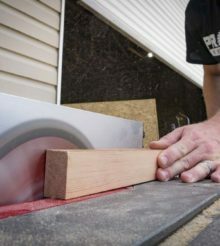 It prevents the far end of flexible pieces from wobbling, allowing you to push the piece through the cut without the stock lifting from the table around the blade. The results are cleaner, safer cuts. The blade height control and bevel mechanism are more familiar features taken from DeWalt’s corded saws and work just fine. The safety guard over the switches prevents the user from accidentally turning it on since you have to lift up the red paddle to engage the motor. Simply pressing the red paddle turns it off. If the battery dies during use, the saw will default to “off” so it doesn’t start back up when you replace it. DeWalt calls this the Power Loss Reset. It might become the best tool on Earth if it had an AC adapter like DeWalt’s miter saw. That would greatly increase the FlexVolt’s flexibility for obvious reasons. But I know that there are engineering challenges and price point targets that can conflict with that goal (though there are whispers of one coming). So in lieu of that, I’d love to see the kit come with the 9Ah battery instead of the 6Ah. The saw performs just fine on the 6Ah, but I purchased the 9Ah and I haven’t regretted it for a minute. You get all the power you need for about as long as you need with as much portability as you can handle. That’s all assuming you’re good with an 8-1/4-inch blade capacity. Some Pros aren’t going to be happy with unless they have a 10-inch jobsite table saw. DeWalt already has already proven they can match the 15-amp motor on their miter saw with two batteries, so it will be interesting to see if that upgrade comes down the road. The good news is that if they do, the AC adapter for two batteries is already in production. Two questions pop up when considering a cordless table saw – power and capacity. The DeWalt FlexVolt Table Saw bumps down to an 8-1/4-inch blade with 2-1/2-inch max cutting capacity to deal with its single battery power source. With the capacity it has, I find there’s enough power to get the job done without regrets of cutting the cord. It’s gutsy for DeWalt to present a cordless table saw to the world, but it really is a solid step forward with the only major trade-off being a smaller blade. It’s an excellent performer and I take it with me to every job. Of course, I started off skeptical of a battery-powered table saw, but it replaces my bigger, heavier full-sized version for most of the work I do. In the absence of an AC adapter like the one on the FlexVolt miter saw, I suggest going with the 9Ah battery instead of the 6Ah battery in the kit. If you’re going to commit to the FlexVolt line as a whole, it makes sense to have a couple of 9.0’s at your disposal. Otherwise, this saw is a home run thanks to feature set taken straight from their popular corded models. Derek Nichelson has been a carpenter for sixteen years and owned Redeemed Carpentry for four years. He specializes in finish carpentry, cabinet carpentry, windows, doors, and siding. Battery powered heavy duty tools are just good for light work, corded are still the best. Got one, love it, haven’t got to use it as much as I would like but so far an awesome tool.